Each fall brings the theme of abundance back into my life, and this year is no exception. Right now, I am joyfully buried in it. As a consumer this adds stress (the holidays? already? 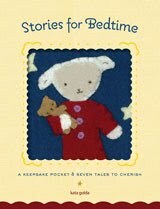 ), but as a small-business owner I have a different outlook. Because I make most every item to order by hand, I am finding myself appreciative of the early order placement that this new trend brings. Stores place their inventory orders early, leaving me more time to make the items individuals order in November and early December. 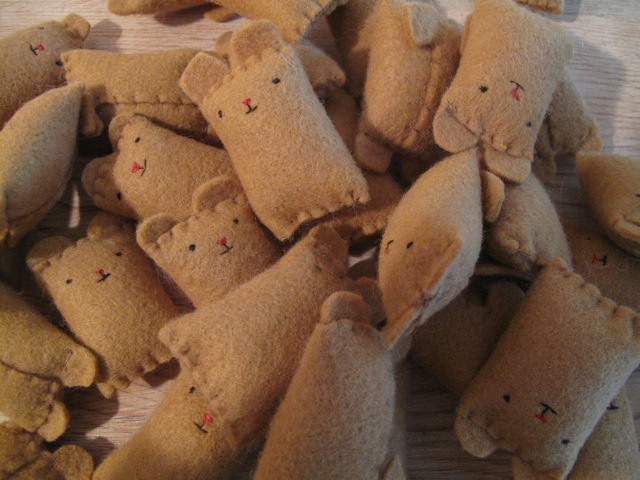 During the process of cutting and stitching, I am still and focused — there is satisfaction in working on multiples of the same design, giving slight variation in expression on each character. 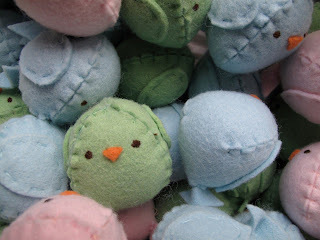 A flock of egg chicks, hatching in 2012. 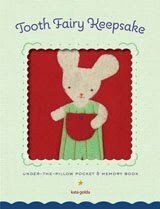 It's the perfect way to "cozy up" on a rainy fall day, and when the work day is done I can look at my finished stacks of stitching with a true feeling of accomplishment. Afterall, I don't do this work to be an assembly-line production house; I do it for the enjoyment it brings to both me and the recipients of my work. 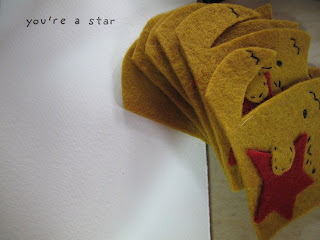 My letterpress printed "you're a star" folded cards, new for 2012-2013, are not yet available online. Contact me directly to place an order. 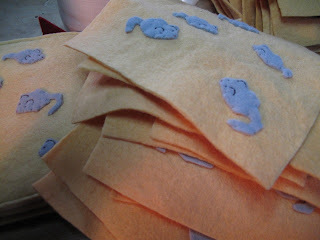 Pages for felt counting books — a great baby gift. I am most appreciative to all of the those retail shops and individuals who have made this pre-holiday season the busiest ever for Kata Golda. Thank you, all, for your continued support! 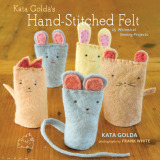 Kata Golda will be returning to Portland, Oregon for another holiday sale with friends at Egg Press in mid-November 2011. Details will be announced in the coming weeks.